My Mom purchased a La Cloche for me several years ago and I have loved making delicious Artisan bread in it. What I love about making your own bread this way is that it only uses 1/4 tsp. instant yeast and ferments overnight for a much better, healthier bread. This Whole Wheat Raisin-Walnut Artisan Bread tastes so delicious! 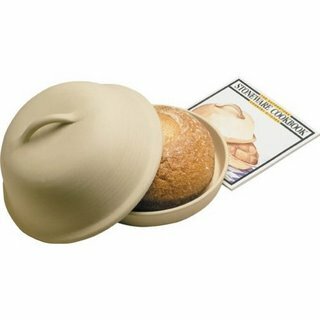 You can purchase a La Cloche from Breadtopia. I also have a Danish Dough Whisk for stirring the ingredients together. This bread is so simple with few ingredients. I like to make 3 loaves, one to eat while warm, one to save for sandwiches and the other to give away:) When making a loaf for sandwiches, leave out the raisins and walnuts. View video instructions on Breadtopia for a basic artisan bread in the La Cloche. I have cut down on the salt, put equal amounts of whole wheat flour to unbleached flour as well as adding raisins & walnuts. Sooo....yummy. Breadtopia has a lot of different recipes for all kinds of yummy breads on their website. Add in the raisins & walnuts after you have formed the dough. Mix together the dry ingredients. Mix in water until the water is incorporated. Dough should be sticky. Fold in raisins & walnuts. Cover with plastic (I use plastic shower caps) and let sit overnight on counter. In the morning transfer dough to floured board and flatten into a rectangle and fold in thirds. Use enough flour to form dough and shape into ball. Transfer to well floured bowl or basket for proofing . Cover with towel and let rise about 1 1/2 hours. Bake in covered La Cloche or Dutch oven preheated to 500 degrees for 30 minutes. La Cloche should gradually heat along with the oven when preheating. Let bread cool completely on rack. Let La Cloche cool down with the oven. You want to prevent extreme temperature changes with the La Cloche to prevent cracking. You do not need to wash your La Cloche. I am TOTALLY making this tonight with the reaisins and walnuts! I cant wait for it! Awesome awesome recipe!! You are amazing! Morgan, thank you! Let me know how your bread turns out. I want to see pictures:)This bread was so delicious! This bread looks yummy! How much raisins and walnuts do you use, and when do you put them in? Does your Mom have a blog too? That would be wild. The bread looks really gorgeous. I would probably taste good w/the Vegan Chick'n Salad. Alright lady, my bread is made and proofing as we speak! I will bake it tonight. Cant wait, it is going to be deeeeeeeeeeeelish!!!!! Shen- Yep, my Grandma does have a blog!! :) She is the original cook of us all, and its totally in her soul! And she has the biggest cookbook collection I have ever seen!!! Shen-Thank you for your nice comments. The bread is so yummy...I have been munching on it for days now. It's good just plain because of all the flavor. My Mom does have a food blog and she would love it if you stopped by-http://tastytidbits1.blogspot.com/ She has always had tons of fruits, vegetables and home cooked food around. Morgan is right, she does have the biggest cookbook collection around. Morgan, I NEED PICTURES of your bread after you make it. I made another loaf today and gave it away. It turned out so good. I am getting ready for the second rise (1.5 hours) and then baking. I will take pics for sure!!!! Hi Debbie, thanks for dropping by my blog and leaving a nice comment. Now I see where Morgan get's all of her awesome skills from. ;) I'm super intrigued by this La Cloche clay baker, and it is officially on my wish list. So glad you posted this! I baked as directed, but it was a little underdone. I have a probe thermometer, can you suggest a core temperature? Raw Coconut-Creamsicle Smoothie - Fight that Cold & Cough! Come stay in our home. Take a vacation to St. George, Utah and see Zions National Park. Save 100 Million Gallons of Water! The medical and/or nutritional information on this site is not intended to be a substitute for professional medical advice, diagnosis, or treatment. Always seek the advice of your physician or other qualified health provider with any questions you may have regarding a medical condition.